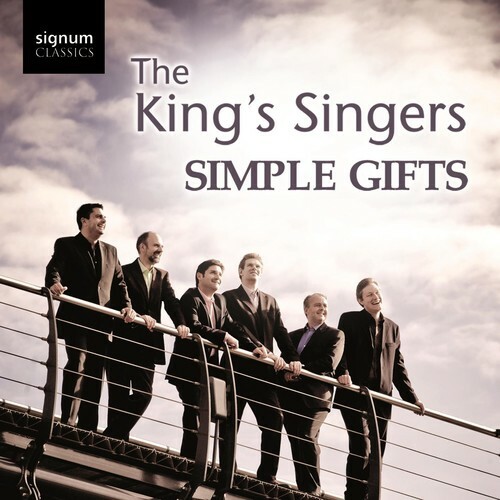 "Simple Gifts" is a very rare and special gift to us, as it represents the first full a cappella studio album by the legendary King's Singers in 10 years. Arguably the most popular a cappella group of all time, whose flawless harmonies grace over 30 finely-crafted CDs and a slew of songbooks in the Primarily A Cappella online catalog, we will assume that you know how good these six British men really are. So let's talk about some of the 16 carefully-selected songs: Billy Joel's classic "She's Always A Woman," James Taylor's sublime "You Can Close Your Eyes," the traditional joyous round "The Gift to Be Simple," Stephen Stills' harmonic CSN&Y gem "Helplessly Hoping," some wonderfully-arranged spirituals, "Swing Low, Sweet Chariot," "Deep River," "The Water is Wide" and "Steal Away," all of which feature some sweet deep bass leads. Randy Newman's poignant "When She Loved Me," Sting's "Valparaiso," Paul Simon's "April Come She Will Come" these are some of our picks for the most beautiful songs of all time. They are arranged by group member Phillip Lawson, Bob Chilcott and Peter Knight, and then sung as beautifully as you can imagine by the King's Singers. The King's Singers incredible blend and tuning goes to ensure that this is probably their finest recording in a long time. Enough said!